This was perhaps when I got a lasting taste for Barry Gray's wonderfully compelling, massively over-orchestrated, theme tunes. I loved the space ship launch, shown in the clip above (repeated as 'stock footage' every episode); and the Robbie the Robot character. 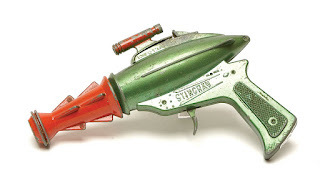 But Fireball XL5 didn't get into my 'real life' - the first to do that was Stingray. Was there ever a more exciting intro for a 5 year old? Those massed drums! The stentorian announcements! Alas, the show itself was rather slow-moving - even for those days - but the villains were creepy enough, with their fish-shaped submarines. A school book has survived in which, as an infant, I drew a picture of this show. Next came Thunderbirds, and my enthusiasm became extreme. Me and my friends got into trouble wearing our 'uniforms' to school - each of them improvised using various elements - mine was based on Boys Brigade regalia. And there was more. My introduction to the next Gerry Anderson was... interesting. One Sunday afternoon I picked up a comic which informed me (in a 'News Report) that the world was under sustained attack from Mars, by some aliens called the Mysterons. It seemed so serious and urgent that I wanted (I still recall the moment) to run straight to my father to find out more, and what we should do. Then I gradually realised that this was a fiction linked to a new Gerry Anderson puppet show: Captain Scarlet. I soon became absolutely crazed about this new show, engaging in considerable role playing at school and in the holidays; and buying an excellent waterpistol, and an annual. 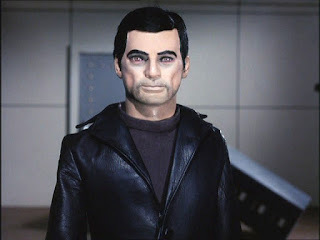 After Captain Scarlet I began to become more of an adolescent; but as my younger brother grew up I came to enjoy Joe 90, with its grossly improbable situation (Father uses his 9 year old son for dangerous espionage operations, by giving him the brain-waves of various experts). My final Gerry Anderson experience was the live action series UFO - with yet another great theme sequence and montage (more Alfie Pugh here). By this time I was in my mid teens, and Lt Ellis on moonbase (played by Gabrielle Drake) certainly had something to do with my regular viewing. 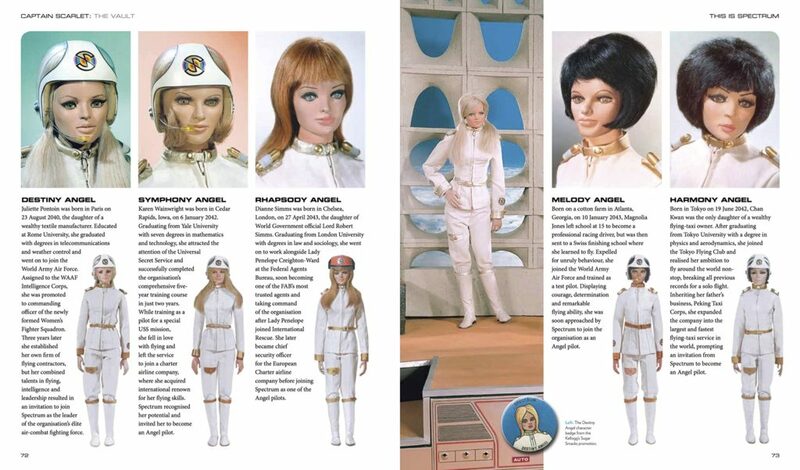 I fondly remember watching Thunderbirds, Captain Scarlet, and UFO on TV back in the 1970s. "This is the voice of the Mysterons!" My own treasured childhood possessions were the Dinky Toy UFO interceptor and the toy Thunderbird 2. @Dexter - I had a very natty little Thunderbird 4 (the yellow submarine) which I got from a packet of breakfast cereal! I'm about four years older than you so my earliest Gerry Anderson series was Supercar which ran on a local Southern California TV station when I was seven. At the time I did not know the show was made in England any more than I knew that the animated Adventures of Tintin running on that same station was Belgian in origin. A publisher called Gold Key had the comics rights and put out three issues, I think, and I later got a plastic electric toy of the eponymous vehicle. When I was nine years old I was introduced to a boy two years younger by my mother and his mother. His father was American and in the USAF and his mother was British. I could describe him as 'half American and all English'. He was probably more intelligent than I so it made him easy to relate to, though I could be crankily ungracious at times if I was feeling jealous. His aunt in England would forward him copies of TV Century 21 containing cartoon stories of all of Anderson's productions but with the characters drawn in normal human proportions. That was how I was introduced to Stingray and Thunderbirds ahead of their American debuts. It was odd to see the characters in them, already familiar to me from the comics, rendered in the gnomish puppet proportions. That magazine also had the comic rights to some American shows like My Favorite Martian, The Munsters, and Burke's Law. (Amos Burke was chauffeured on his rounds in a Rolls-Royce. Hmm..) It also had The Daleks. David Cronenberg said that one needs "a great longevity of energy" and "a very thick skin" to work in film. "It's not a sprint race, it's a marathon." The few biographic details I find about Anderson more than hint at many professional and personal setbacks, so he certainly had that energy, but his works never look as though he and his collaborators found their making unrewarding. @A probst - Thanks for that excellent comment! I agree about Anderson. I sensed an underlying seriousness and striving about his early and middle work that made it more than the sum of its parts; and ideal for boyish gamplaying and fantasy. Success and freedom came a bit late for full realisation. Terry Nation is another person, a scriptwriter, of that era who I felt was always pushing against the constraints to try and say a bit more. I am quite keen on Blake's Seven, for its characterisation and storytelling (at least of Blake, Avon and Servilan), and a mid-seventies, post-apocalyptic TV series called Survivors made quite an impact on me at the time.